October 11 2014 saw the opening of a whole new chapter in the struggle of the working class in Ireland. Discontent that had been bubbling for some time suddenly hit the streets of Dublin with a 100,000 strong demonstration in an eruption against water charges and austerity from below. 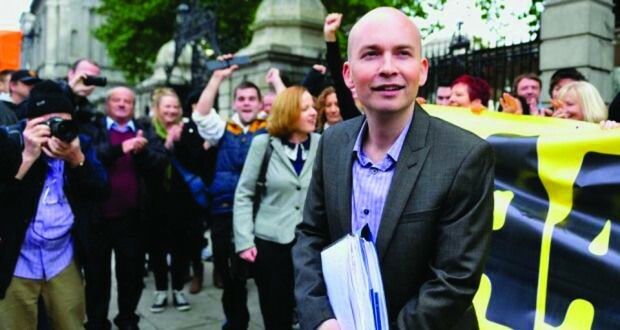 On the same day, the same wave of anger catapulted Anti Austerity Alliance (AAA) candidate Paul Murphy to victory in the Dublin South West by-election, defeating a stunned Sinn Fein, along the way. The by-election campaign exposed the emptiness of Sinn Fein’s “radicalism” and has changed the dynamic of the political situation. It put down a marker, showing how a serious left challenge can be built. November 1 saw further demonstrations against water charges around the country and this time 150,000 turned out on a day of torrential rain. The by-election and these demonstrations together have given many people new confidence that now, after six years of austerity, there is a chance to build a new fighting movement for working class people. This is in stark contrast to the mood last year, which just demonstrates how quickly and how completely things can change. Ironically, essential to this change was the extensive propaganda that Ireland is experiencing an economic recovery. The heads of many people lifted as the talk of endless crisis was replaced with the prospect of an economic improvement. When the “recovery” turned out to be a recovery for the rich and austerity continued, particularly in the form of the water charges, people proved more open, and more angry and impatient than before. The change has gripped the most disadvantaged sections of the working class, in particular. Their positive class instincts have been displayed, alongside an understandable anti-party sentiment and suspicion, largely because of the role of the Labour Party. The changed situation was reflected in the local and European elections last May where the Anti Austerity Alliance (AAA), which the Socialist Party is part of, saw 14 councillors elected in Dublin, Cork and Limerick. Some other lefts and ‘Independents’ (reflecting the disgust at the political establishment) also did well. The main gains, however, were made by Sinn Fein, which went from 54 councillors to 159, and from having no MEPs to getting three out of the country’s total of eleven. Sinn Fein won over 15% of the vote in the local elections and close to 20% in the European election. Alongside the unpopularity of the government, this put Sinn Fein in pole position to become the biggest party in the country, with the prospect of being part of the next national government. On 9 October, the day before the Dublin South West By-Election, a poll indicated that Sinn Fein had increased its national support by 4%, up to 24%. The growth of Sinn Fein, as well as the vote it received in the Dublin South West area in May’s elections, caused all commentators to predict a Sinn Fein victory. Paddy Power bookmakers put Sinn Fein candidate Cathal King 1/25 odds on favourite to win. There are just less than 40,000 houses in Dublin South West. In May’s local elections, the AAA did not stand a candidate in the Terenure / Templeogue area of the constituency, where Sinn Féin won 12%. They also beat the AAA in two other wards in the by-election constituency, by 32% to 22% in Tallaght Central and by 52% to 12% in South Tallaght. We knew that winning the by-election would be difficult, but we felt that if we were able to make water charges the dominant issue we could feature strongly because of our record and our fighting stance on this issue, in contrast to Sinn Fein. Sinn Fein has not seriously fought any of the unjust taxes or charges of the last twenty years. While the party said that they opposed water charges, it refused to advocate mass non-payment. So, essentially, while Paul Murphy’s campaign always began by attacking the establishment, from the very start of the election we also had to take up Sinn Fein very sharply. The date for the by-election was only fixed for 10 October when the writ was formally moved in the Dail 17 September. We didn’t have the luxury of waiting for the formal election date announcement. So while election rules meant we could not display posters until then, we launched our campaign with six street stalls on 6 September and our door knocking started on Monday 8 September. Our first leaflet began dropping through doors in the middle of September. The main headline was, “Scrap Water Charges & Austerity” and on the back under a headline stated, “A movement you can trust”, we set out the case for the AAA and Paul. We also said: “Unfortunately Sinn Fein refused to promise to abolish water charges if in government; rejected the AAA proposal to establish an anti-austerity bloc on South Dublin County Council and instead did a deal with a pro-austerity Labour Party… [Sinn Fein] has 14 TDs and over 150 councillors but has failed to use those positions to wage an active struggle against austerity.” We concluded that a new fighting movement for working class people was needed. This argument, skilfully put to people during our daily street stalls and on all door to door activities, began to ratchet-up the pressure on Sinn Fein. We successfully used the comments on the radio by a leading spokesperson for Sinn Fein (on 11 September), that they would not make the abolition of water charges a precondition on entering the next government, as further proof that they could not be trusted. Water charges are a huge issue and will cost many working class families more than €500 a year. Bills were due to arrive in January but the actual billing period started from 1 October. Irish Water, the new company established to oversee the charge, began sending out “information” packs to each household in the country. At the same time, there was no enthusiasm for the by-election. So on the stalls and on the doors, we did not start discussions with people by mentioning “canvassing” or “by-election” but said that we were from the newly established AAA and were organising against the water charges. This made a real connection with people. In the course of the conversation we would say that Paul Murphy was standing in the by-election and how voters could use this fact to put all the parties, including Sinn Fein, under pressure over water charges. We also organised public meetings on how to fight the water charges, throughout the constituency. These were attended by 600 people approximately, with an additional 150 attending two street meetings we organised. A special “All you need to know about the water charges” AAA leaflet, with only a brief mention of the by-election was distributed and helped to establish the credentials of the Anti Austerity Alliance as the foremost group fighting on the issue. Initially, a key message in our election literature was that unlike with the Property Tax introduced the year before, the water charge cannot be deducted from people’s income. We also made this important point on eight, sixty-foot banners that we displayed publicly across the constituency. This meant that people were in a more powerful position, could refuse to pay the charge and make a fight out of it. This realisation, which only our campaign publicised, was essential in giving people confidence. We understand it was Sinn Fein’s intention to fight the election on the issue of housing, which is also a vital issue that we featured heavily. However, when they went into working class areas, because of our early start they were met with a ‘wall of water’, i.e. people asking them about their position on water charges. Sinn Fein was not able to run the campaign they wanted to, but instead immediately were on the defensive. Sinn Fein emerged strengthened from the local and European elections, so we knew we had to try to interrupt the electoral drift towards them by using the example of the water charges to sow doubts about them being a different, genuinely anti-austerity party. We pointed out that they are going in the same direction as the Labour Party, whose ‘anti-cuts’ posturing before the last general elections allowed the party to make big gains. In that context, presenting that the AAA was a step towards launching a new movement that would really fight for all working class people was a very important underlying argument in our campaign. Each morning of the election campaign, AAA supporters held anti-water charges banners alongside rush hour traffic in key locations and gave out leaflets. This was seen by thousands and got a huge response. We ran daily street stalls and each Saturday we had multiple stalls throughout the whole constituency. Each night we had three separate canvass centres, organising simultaneous door knocking in the three distinct parts of the constituency. People were meeting our campaign in many different locations and situations and this created a powerful momentum. When the announcement of the election was made, we had more than twenty poster teams ready to act and they very quickly erected 1,200 large posters. Most of the posters ran the slogan, “Rock the government and the opposition parties to make them: SCRAP WATER CHARGES”. We were the first campaign to put up many posters and this helped put water charges at the centre of the by-election and also boosted Paul’s profile. After the initial poster run, we used two additional batches of 600 slightly smaller diamond posters, one in the second last week of the campaign and the other in the last week. Throughout the campaign we also erected large billboards and hung up sixty foot and forty foot long banners throughout the constituency. One of our diamond posters pre-emptively parodied a Sinn Fein poster that we knew they would re-issue. Last May, in order to tap into people’s dissatisfaction with Labour in austerity coalition government, Sinn Fein produced an effective diamond poster that simply said, “Make the Change – Vote Sinn Fein”. We knew they would use this poster again but before they could get going we produced our own, “Make the REAL Change – Vote 1 Paul Murphy AAA”. This meant that every one of Sinn Fein’s posters potentially reminded people of our criticism of Sinn Fein. If we were going to really challenge Sinn Fein, overall, we had to at least match their vote and do better than them on preference votes in the better-off working or middle class area of Terenure / Templeogue. In Tallaght Central, where the AAA had its strongest base but still trailed Sinn Fein, we needed to out-poll them. And finally in Tallaght South, which encompasses what is actually called west Tallaght, we needed to massively cut the huge Sinn Fein lead, where they got 40 percentage points more of the vote. That we audaciously went straight into west Tallaght, which Sinn Fein considered to be their heartland, really shocked Sinn Fein. That we got a very good response from local people, including for our criticisms of Sinn Fein on the water charges, horrified them. We held a water charges public meeting in a part of west Tallaght on 17 September attended by sixty locals. A Sinn Fein councillor attempted to interrupt Socialist Party TD Ruth Coppinger when she was making critical points about Sinn Fein’s approach. What ensued was a no-holds barred argument in which the public turned on members of Sinn Fein present. We understand that Sinn Fein shifted teams from other areas into west Tallaght, which gave us a freer run in those other areas. Our positive message, that people could refuse to pay the water charges and could defeat it, exposed Sinn Fein’s utter cynicism. We believed that if we got our message out, even though Sinn Fein had a reputation of being anti-establishment, particularly in disadvantaged working class areas, people would respond positively. Sinn Fein resorted to personal abuse against Paul Murphy. They said Paul was not from the area. They claimed that non-payment of the water charges will see residents build up huge debts that they will inevitably have to pay and that they will also face hefty financial penalties. Sinn Fein was trying to instil fear and demoralisation as a means to win the election. But they completely underestimated people’s fighting spirit and their ability to really understand the different approaches on resisting water charges. While we clearly had momentum, we still had a mountain to climb as Sinn Fein started the contest way ahead of us. It is a very difficult thing to expose a party’s future sell-out, which in a sense was what we were trying to do. We were affecting many people with our arguments on the water charges but many were conflicted as they still had a loyalty to Sinn Fein. We explained that this was a by-election and the dominant issue is clearly the water charges. We said to voters that if you do not support Sinn Fein’s position on water charges, then use this election to send them a warning about their poor position by voting number 1 for Paul Murphy. As a sign of the effectiveness of our campaign, Sinn Fein was forced to change its position mid-campaign. The party said that the abolition of water charges was now a pre-condition before they would go into a new coalition government. In response, we produced 25,000 new leaflets that pointed out that putting pressure on Sinn Fein is working, so keep it up! Sinn Fein’s own polls a week before the election indicated that the AAA was doing well, but that Sinn Fein was well ahead and on course to take the seat. But momentum is very important in elections and we felt this contest would come down to the last week, the last days and even the last hours, and so it proved. The main issue during the by-election was water charges and the duelling between the AAA on the one hand, and Sinn Fein on the other. The fact that Paul had been a Member of the European Parliament and ran a very credible European election campaign, in which he won 8.5% of the overall vote in Dublin, may not have been to the fore in most voters’ minds during the by-election, but it played an important role in re-enforcing the AAA campaign. A week before the poll, the unrelenting pressure that Sinn Fein were under was demonstrated when senior figures, including Mary Lou McDonald and newly elected MEP for Dublin, Lynn Boylan, both retweeted a fake Facebook conversation which supposedly implicated Paul Murphy. The posting effectively tried to portray Paul as admitting he was lying regarding Sinn Fein’s position on the water charges and that he was abusing the issue to get elected. Any serious examination of the posting would have raised immediate doubts about the truthfulness of the tweet. That such senior Sinn Fein figures re-tweeted it was a clear signal that Sinn Fein was very concerned about Paul’s campaign. Sinn Fein was forced to apologise for retweeting the lies about Paul. Paul’s strong performances in the media and his ability to articulate a clear message, both during the European elections but also in the last week of the by-election, also had an important impact, including winning preference votes for AAA. A letter from Joe Higgins TD, designed to maximise the ‘number 1s’ but also to specifically appeal for higher preferences than Sinn Fein, was distributed into the majority of the homes in Terenure / Templeogue, two days before the vote. Voting began at 7am on Friday 10 October. We decided that with the exception of some high profile leafleting and driving around the constituency with speakers on a car announcing our messages and slogans, we would scale-down the effort in the Terenure / Templeogue and Tallaght Central areas on the Thursday and shift all our resources into west Tallaght. We appealed to supporters to take a day off work for the final push. One hundred people turned out for activity in west Tallaght. Elections tend to wind down the day before the vote but this time we decided to do the opposite. Because it was a ding-dong battle in that area, we wanted to be the last campaign to talk to people before they went out to vote on Friday. Our plan was to canvass all 12,000 houses again, in one day, with a new hard-hitting leaflet on the water charges and Sinn Fein, and we succeeded in what proved to be a ‘Super-Thursday’. We decided on this approach the week before election day and that turned out to be doubly fortunate. On Wednesday 8 October news filtered through to us that Sinn Fein leaders, Gerry Adams and Mary Lou McDonald, responding to a question at a press conference as to whether they would or would not pay their water charges said they would indeed be paying. While, in a way, this is the logical extension of their position of accepting that these water charges have a legal basis, nonetheless, given the popular hatred of the charges and the clear inability of many people to pay, the Sinn Fein leaders’ statement was very significant, even if it was not prominently featured in most of the mainstream media. If news of this effective abandonment of non-payers by the leaders of Sinn Fein was to become a real factor in the election that was taking place in just one day’s time, it was going to be up to us to get the word out. So our plan for a late mass mobilisation dovetailed completely with that. On Wednesday, but particularly the Thursday before the election, nearly 25,000 houses in the Tallaght area got another new leaflet exposing this latest position of the Sinn Fein leaders and as mentioned, west Tallaght was canvassed again by the AAA. The fact that Sinn Fein leaders were going to pay the water charges and, crucially, our mass activity, had a huge impact. Sinn Fein was not expecting such a mobilisation and in response they tried to get some of their activists into the areas on Thursday night and on Friday. However, we were also in these areas on Friday and Sinn Fein’s efforts were too little, too late. Our election campaign only began to wind down after 9pm on Friday night when there was less than an hour of voting time left. Then we quickly pulled together our preparations for the count, which was starting at 9am, the following morning. On Wednesday, the pundits on the state broadcaster, RTE, said it would be impossible for the AAA to catch up with and beat Sinn Fein. On Thursday, new opinion polls showing a significant increase in Sinn Fein’s support nationally must have reassured its leaders. However, to paraphrase Joe Higgins TD, when speaking about the coalition government last May, by 6pm on Saturday Sinn Fein left the count centre in Tallaght pummelled and punched-drunk, staggering around, dazed and defeated by the AAA and Paul Murphy. After the first count, Sinn Fein had 7,288 votes (30%) and the AAA was 748 votes behind on 6,540 (27%). However when the other candidates were progressively eliminated, the AAA got an additional 3,025 transfer votes while SF got just 1,711, meaning in the end Paul Murphy and the AAA won by 566 votes. The tallies gave the breakdown of the first preference votes for each area in the constituency and showed we had achieved exactly what we targeted. This time we outpolled Sinn Fein in Terenure / Templeogue by 19% to 14%. The same in Tallaght Central by 34% to 29%. In South Tallaght (west Tallaght), Sinn Fein got slightly more than they won in the local elections in May, but the AAA’s vote rocketed from 12% to over 30%. The absolute comparison to the first preference votes cast in May is striking. In May, in these areas, Sinn Fein got 9,737 votes, so they were down 2,449 votes. In May, the AAA got 3,537, so the AAA actually increased its vote by an incredible 3,003 votes, an 85% increase, on a significantly lower turnout compared to the local elections. It was not only Sinn Fein that was stunned by the result. So too was the political establishment, the media and probably people on the left. The government immediately the introduced minor concessions on the water charges but this has only emboldened the view that they must be scrapped altogether. The by-election was the most dramatic illustration yet of the decisive shift that is taking place away from the parties of the capitalist establishment – Fine Gael, Labour and Fianna Fail. It is incredible that between them they could only muster 26% of the vote. The whole capitalist establishment combined was outpolled by Paul Murphy and the AAA. In west Tallaght, the vote was completely polarised between the AAA and Sinn Fein, and all the other parties, including the pro-establishment parties and independents, combined got only 13%! After the event, the newspapers said that the creation of the AAA and our election campaign concentrating on water were a “master stroke in tactics”. The papers also noted that Sinn Fein was, for the first time, outflanked on the left. The decisive factor for the AAA victory was the development of a new fighting mood among significant layers of the working class. This was fully brought out and given confidence and direction by a principled but hard and unrelenting campaign waged by the Anti Austerity Alliance. Huge tribute is due to the Trojan efforts of the local AAA activists. The full experience of the Socialist Party in fighting elections was also brought to bear in this campaign. Lefts and genuine activists should adopt the approach taken to Sinn Fein by the AAA in the by-election, as that is the best way to carve out a real base for a left wing and socialist position, which would constitute a step forward for the working class movement. While it sometimes adopts radical, anti-cuts sounding rhetoric, Sinn Fein is not a party of the left and its development will result in a similar situation for its voters as that which faced Labour voters – wasted hopes and disappointment. Unfortunately some, including the People Before Profit Alliance and the SWP, refer to Sinn Fein as left and anti-austerity and imply that it has something to offer the working class. If the AAA had adopted a similar approach, Sinn Fein would have romped home. Sinn Fein’s position on water charges clearly shows that sell-outs are inherent in its approach. They wanted to be able to use water charges as a bargaining chip in the formation of the next government and that is why the party leaders refused to say water charges were a ‘redline’ issue. That means either they would have kept water charges if in government or if they did abolish them it would be part of a deal that accepted other austerity measures. Sinn Fein is preparing to manage austerity in the south, as they have done in Northern Ireland as part of the power-sharing Assembly Executive, because their approach is to work within the confines of the capitalist system. The job of the left is to provide a principled left alternative. The focus must be on building a new independent movement for the working class, not implying that Sinn Fein represent a step forward. Sinn Fein can and must be outflanked by a principled left. Such is the political vacuum that exists in southern Ireland that Sinn Fein can still do well in the next general election. However, along with very serious issues currently aired in the media and by politicians about how Sinn Fein dealt with IRA members who raped and abused women, it is clear that the by-election and Sinn Fein’s position on water charges has damaged the party among a whole layer of people just coming into activity. This was indicated in two out of three opinion polls published since the by-election. If the left and the new activists and groups that are emerging came together and advocated the points above, and responded to Sinn Fein in a firm way, a strong and principled working class left could emerge out of the next general election, which is just over a year away. That could be the real opposition to the next capitalist government, whether it includes Sinn Féin or not, and could put a real fight for genuine socialist change on the agenda in the years ahead. The most significant thing about the anti-water charges demonstration on 11 October was not the huge numbers, nor its very working class composition, though both these factors were very significant. Most importantly it was a mobilisation that was not organised in the normal sense; it was a mass mobilisation from below – a DIY or self-mobilisation of the working class. Like the by-election, this reflected the change that has taken place, in particular the anger at and intense activity against the installation of water meters by Irish Water that has engulfed many working class communities, particularly in Dublin in recent months. While the demonstration was called under the umbrella banner of Right2Water, which was initiated earlier this year by the People Before Profit Alliance (PBPA) and a couple of unions (the AAA and Socialist Party are also part of Right2Water), it was clear for a number of weeks beforehand that working people focused on the march date and were mobilising for it, as the means to come together, to vent their anger and to make a stand against water charges and austerity. The original plan was to have a demonstration in September, but the Socialist Party argued within Right2Water that it should be in October, closer to the government’s Budget Day. The demonstration’s significance is re-enforced if you compare it to the last demonstration organised by the Irish Congress of Trade Unions (ICTU) on 9 October 2013. 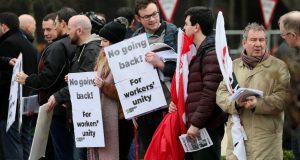 In total, ICTU mobilised 60,000 around the country that day and certainly no more than 40,000 people in Dublin; most of whom then left the protest disgusted when ICTU leaders failed to put forward plans for real action against austerity. The real significance of 11 October 2014 is that working class people had cut through the demoralising fog created by ICTU’s ongoing sell-out of the last six years, had climbed over ICTU leaders’ roadblocks and now organised their own mass mobilisation. A number of years ago, residents of Ballyhea, a small village in County Cork, began holding a protest march every Sunday through the main street against the bailouts of the banks and austerity, under the banner, ‘Ballyhea Says No’. The idea of ‘Says No’ entered the popular psyche. In parts of the cities, groups have come together and in quite a number of cases have put the name of the area before ‘Says No’, or used some other similar name as they get organised and set up local groups. The catalyst that has caused many of these groups to now emerge has been people resisting the installation of water meters. The importance and penetration of Facebook in working class areas has also been quite striking, with local anti-water charges Facebook pages springing up and Facebook being used to warn of where water meter installation is taking place and to mobilise people to protest. There have also been some serious skirmishes with the police in a number of areas where there are attempts to install water meters, particularly in parts of Dublin, but also in Cork. Disgracefully, the police have been mobilised to assist Irish Water imposing its metering policy. Many protesters have been arrested but no one has been sent to prison, so far. To assist in organising a response to metering and to help get organised against water charges, people have also improvised new methods. Street meetings have emerged as a simple and very quick ways of pulling the community together. By word of mouth or simple flyer, people are meeting, often at the green patches in housing estates or communities. One part of north-east Dublin has seen more than ten ‘Says No’ type groups being established, as well as a general affiliation by large numbers of people to what, in effect, is a new community movement against austerity. In this area, thousands have attended street meetings. The use of street meetings in early evenings or Saturdays is now becoming generalised, attended by anything from ten to fifteen people or up to a couple of hundred and more. These were the type of local developments that were taking place in a number of parts of Dublin which fed into the mass mobilisation on 11 October. Two weeks later, 10,000 marched through the streets of Limerick led by We Won’t Pay, the non-payment campaign initiated by the AAA. Given the size of the city, this was equally as impressive as 11 October. Very big demonstrations continued in many areas, which culminated in the national day of action on 1 November. This showed that the movement is gaining momentum, as at least 150,000 turned out in local and regional demonstration around the country, piling the pressure on the beleaguered government. The strong sentiment on these demonstrations and among the working class, particularly those under fifty, is not to pay the water charges. However, while Right2Water set the date for what turned out to be a mass demonstration, this campaign makes a virtue out of not advocating mass non-payment. From the start, Right2Water pointed people towards a more conservative campaign of political pressure on the parties and not towards an active campaign to build mass non-payment. Because of this, there is a serious question mark over whether Right2Water can play a positive role or will cause confusion and potentially undermine people’s confidence when the battle lines on water charges get clearly drawn in the new year. Right2Water is now being used by some, including Sinn Fein, which is part of it, and some unions, as a cloak to hide their refusal to actually fight against water charges. To pretend to the working class that they are seriously opposed to water charges, they point out that they are part of Right2Water. In terms of Sinn Fein, the more the Dublin South West by-election has exposed their real position, the more they are trying to wrap the Right2Water banner around themselves in local areas. Unfortunately there is a prevarication by some on the left, such as People Before Profit Alliance and some left TDs on the issue of non-payment and this is creating a danger for the new movement. While there is huge hatred and anger at the water charges, significant layers of people, particularly older people, are still fearful and not confident about non-payment. While the charges are universally hated, a recent opinion poll indicated that 41% would pay the water charges, 25% would not, 18% said ‘it depends’ and the water charges were not applicable to the other 8%. In this situation, lefts and socialists should be leading the way and giving people the confidence to add the mass, organised non-payment tactic to the mass mobilisations that are taking place against water charges. They need to explain that water charges cannot be deducted from peoples’ income and that peoples’ water cannot be disconnected anymore. Furthermore, working people need to be encouraged to see that the weakened Fine Gael / Labour government can be decisively knocked back by mass non-payment and an active struggle. Instead, non-payment is sometimes mentioned in the odd speech or in the small print in a leaflet, but there is a refusal to advocate organised, mass non-payment as the essential and central tactic and as a platform from which the water charges can be defeated. The 100,000 plus demonstration on 11 October and the 150,000 mobilised three weeks later are arguably the most important demonstration of recent decades because they are really a mass eruption from below. 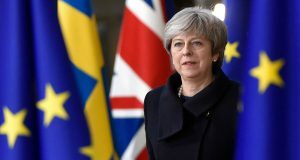 It demonstrated that large sections of people had overcome the setbacks and demoralisation engendered by the ongoing sell-out of the main trade union leaders. In that sense, it is the opening of a new chapter. But whether the movement will continue to grow and develop over the next weeks and months can depend on what tactics the government and state uses on water charges. And also whether the new activists being created can keep the momentum going and, crucially, if a fighting lead that gives people confidence emerges in the movement. October 11 and November 1 represent the emergence of a new working class movement, beginning in the communities. It clearly shows that people are beginning to get active and organised unlike anything since the start of the economic crisis six years ago. An active working class movement can shake things up in the trade unions and open up opportunities to get organised there, and challenge the position of a bureaucracy that still refuses to fight. In terms of resistance, struggle and the potential for a left and socialist challenge, a spectre is emerging to haunt the capitalist establishment in Ireland.